China’s implementation of its ‘National Sword’ policy and the mounting despair at the huge amounts of plastic waste to be found in the world’s oceans is focusing minds everywhere on the use and disposal of plastic. Mindful of their influence and the role they can play in the major global environmental challenges of our time, some of the world’s major brands including Nestlé, Unilever, The Coca Cola Company, and Diageo have launched the Africa Plastics Recycling Alliance. A lack of collection and recycling capacity in many African markets coupled with growing populations is creating a growing problem of plastics waste. The Alliance notes that plastics will remain an important packaging material, but sees an opportunity to tackle that problem in a way that creates jobs and reduces dependency on imported materials while alternatives to plastics are developed. How much funding will be made available to invest in growing recycling capacity and how quickly remains to be seen, but having such major brands ‘on board’ with the aim of developing the waste management sector in Africa, can only be a step in the right direction. The vast majority of recent investment in plastics recycling facilities is in Europe and North America. AcuComm currently lists 143 active projects dedicated to plastics recycling around the world, worth US$2.7 billion in total or around US$18 million each. Of this, only seven projects are listed in Africa, worth US$87 million or US$12 million each. Four of these are in South Africa, with two in Algeria and one in Ethiopia. There is, therefore, plenty of scope for more recycling to be done across Africa, once the relevant infrastructure is in place. Source: AcuComm database. 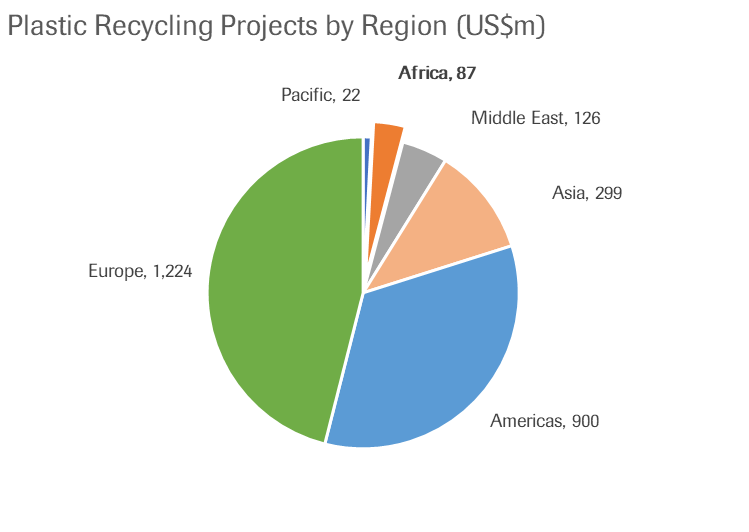 The pie chart shows the value of plastic recycling projects by region as of 1st April 2019. Click here to explore these projects globally. Next Next post: Is technology moving faster than the regulators?